A splash of colour welcomes me to Urban Tamashaa, Bengaluru’s newest restaurant on the swish 100 feet road in Indiranagar. I am thrilled to see a restaurant that has innovative colours as its calling card after being treated to neutral tones for a while. This one has teal coloured chairs, a ceiling coloured with lights in red, white and two shades of blue, wood toned walls and a patterned flooring in hues of wood with hints of blue that give it a stand out effect. We head to our table that overlooks the road so we have a nice view as well to complement our meal. We started the meal with a range of eclectic mocktails like Mango Chill, a mango drink infused with peach, basil, cream and dry fruits that is perfect on a hot afternoon. The complimentary crispies are hard to keep off We also sampled the Spicy Guava drink made with canned guava juice infused with tobasco, lime juice and sugar syrup for a zing. The Lychee Blast made with fresh lemon and mint has a slightly peppery feel so if you enjoy spice you can try it. For starters we sample the Cream of Broccoli soup served in a bun that is rich, cheesy and the florets make for a nice crunch. 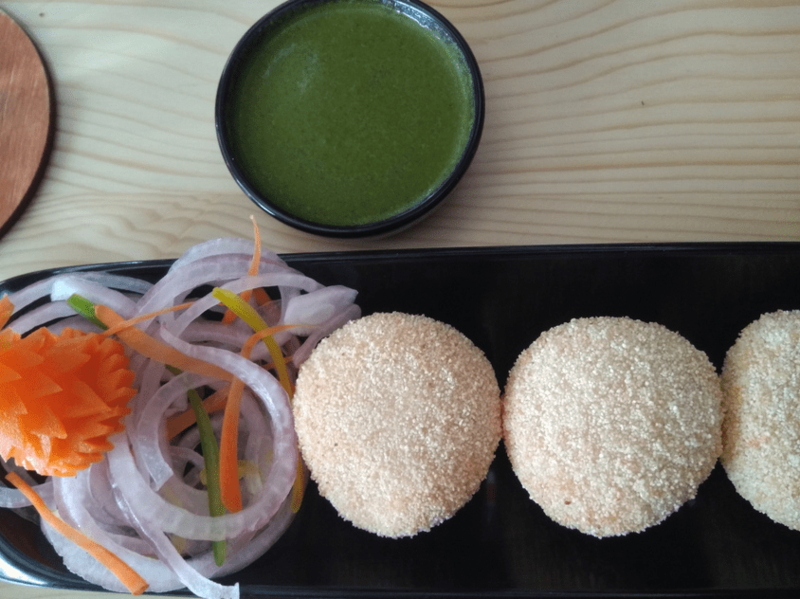 We also tried the signature Dahi Kabab a pan fried kebab stuffed with curd and has sweet taste courtesy the raisins in it and is quite delectable and is served with mint chutney. My vote however goes to the Dragon rolls served in shot glasses made with fresh spinach and cheese rolled in a wanton sheet dipped in a sweet and spicy sauce that teams perfectly with the dish. The extensive menu is an eclectic mix of Indian, Asian, Chinese and Continental fare and apart from the large ala-carte menu there is also a lunch buffet that is quite comprehensive too. 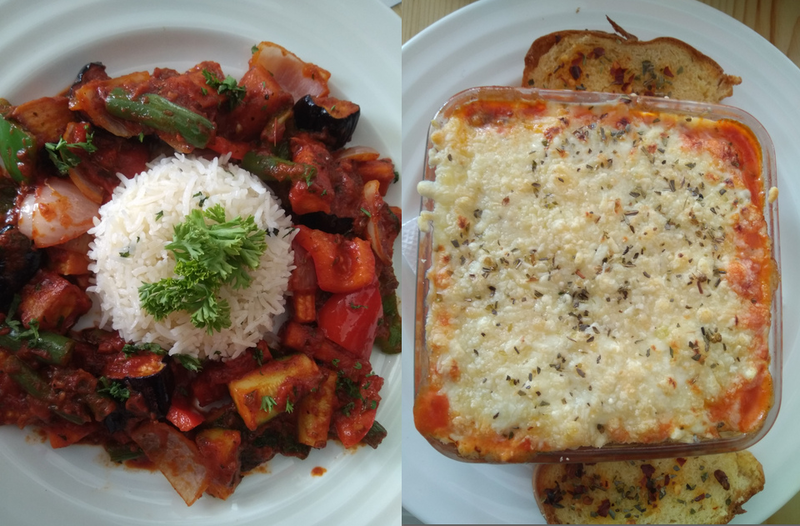 We tried the Vegetarian Lasagne an absolute delight layered with rows of vegetables, pasta sheets, tomato sauce, herbs and cheese that comes together beautifully. Also do try the Vegetarian Ratatouille, a small helping of rice served with an assortment of crunchy vegetables that is wholesome and light. 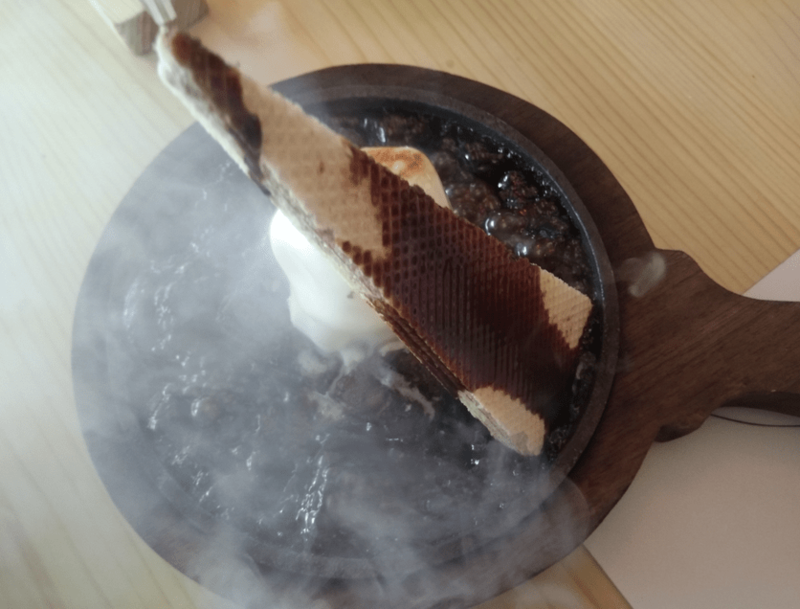 While there are many desserts on offer, we tried the sizzling brownie with Ice Cream and Chocolate Sauce that sizzles and adds drama to a meal that was a good lunch outing in all. A separate kids menu is also part of the offering so kids can rejoice too. Phone: 080 33512969; recommended to book a table in advance.